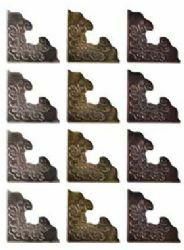 These ornate metal corners can be fixed to the corners of board or canvas or can be folded over to secure pictures and phorographs. The three sided corners are approx. 7mm deep but can be folded or hammered over to be mounted on all sizes of material from 7mm down to very thin. There four each of three different finishes; antique brass, antique copper and antique nickel. This pack contains 12 metal corner pieces.